Renting a property for the first time can be a daunting task, especially when it comes to knowing the right questions to ask your landlord. We’ve put together some of the most important questions you should ask when renting a property. How much is the rent, what is included and when is it due? 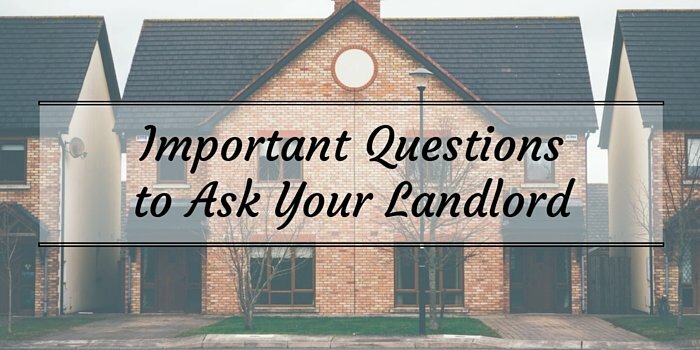 This is the most important question to ask, it is vital that there are no misunderstandings when it comes to the rent, especially what your rent covers, such as bills. Many landlords will ask you to set up a standing order to pay your rent on the discussed date each month. This is the easiest way to avoid late payments and possibly fines from your landlord. How long is the tenancy? What happens afterwards? Many tenancies will be from 6 to 12 months. This will sometimes be extended if there have been no problems during the fixed term. What is the policy with repairs? If the property has a garden and outside area, it’s a good idea to know who is responsible for taking care of this area. Is there a deposit? Where will it be protected? The majority of landlords will require a deposit against possible damage to the property. The deposit will usually be the equivalent to one month’s rent and is refunded at the end of tenancy if no issues have arisen. Since April 2007 any deposit that has been taken against an Assured Short Tenancy (the default tenancy in England and Wales) must be registered with one of three government recognised schemes. It is crucial you make sure that your landlord can tell you which one they plan on using. Will an inventory be made? Before your move into the property it is useful to have your landlord create an inventory of the contents and condition of the property. This could become helpful if there are any disputes in the future. Can I see a gas safety certificate? By law a copy of a gas safety certificate must be made available to tenants who will be living in a property with gas appliances or gas heating. A gas safety certificate can be obtained by having annual safety checks, conducted by a registered engineer who is registered with the “Gas Safe Register”. An Energy Performance Certificate (EPC) is a document that outlines the energy efficiency rating of a property, which will be carried out by an independent assessor. They are valid for ten years and are legally required for every property for rent. Are you a member of the NLA, or of a landlord accreditation scheme? Many landlords will decide not to join any kind of landlord accreditation scheme because it isn’t a legal requirement. If they have decided to sign up then this can be a good sign as it shows a commitment to professional development. When moving into your new house it can be a good idea to have a storage unit. This can make the whole moving process a million times easier.